The F&P Dual is the wind turbine that OZ Winds roots are founded on . Having built many differing versions and models from the Quad Stator many years back up until now where I have done the full circle to now offer this as the "Ultimate F&P Dual ". It is heavily constructed of all steel laser cut components, hand built, with 6mm blade hub machined and blades balanced to give what I have claimed to be the " Ultimate F&P Dual stator " available in the world.Other inclusions are , heavy duty sliprings, cowlings and 1x100S stator while I still have them available. It can also be fitted with the optional ( manual furl ) so the tail can be manually pulled paralell with the blades to be in a parked position for very high winds or for shutdown purposes. This Model Turbine is now Discontinued , It will soon be replaced with an updated version Mk3 to be Released later this year. 3 GOE blades and 2 piece blade hub. Oz Wind are the Australian Distributor For Huaya, who are a highly reputable manufacturer of wind turbines from 500W to 30kW. 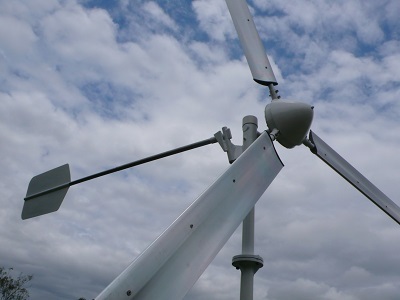 All OZ Wind Turbines under 2.5kw are built on the 2.5kW Nacelle Assy ( longest tail and strongest Nacelle Assy Possible ). From there the Oz Wind modifications and checks are done to make these the best performing 2kw wind turbine in the market today . Our turbines are the only turbines POWERED BY AUS BUILT GOE 222 BLADES, and not the std fiberglass blades . This one single modification puts our turbines Kilowatts ahead in power production over the std turbine, and this is guaranteed. We also back our products Australian warranty, on all manufacture defect problems. Warranty is dealt with here and not with someone who all of a sudden can not speak english. OZ Wind is committed to provide honest info & advice that most other sellers do not can not supply. 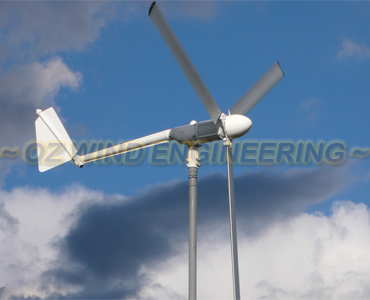 We strive to make systems as economical and efficient at the best possible price for quality that will last.The 2kW Turbine fitted with 3.2m GOE222 Airfoils and coupled with the Oz Wind Capacitor Power Maximizer allows these turbines to produce power in 2.5m/s 7~9klm winds, from there they track the wind better and do not suffer from the constant hunting to the prevailing wind direction followed 360deg turns for no reason the Std turbine suffers from. The GOE222 power difference is easily 2~3 times more accumulated power for storage over the day. this up . At 10 m/s the Oz Wind gen is pushing in excess of 2kW turbine, where the standard is struggling to push through 1kW. The manufactures answer is to fit bigger blade sets @3.8m this greatly increases tower loading and can add to balance problem. For high wind zones we advise to make the blade dia Max 3m for 2kW due to overpowering the generator. We can also retro fit these blades to existing wind generators to give the same results and fully guarantee if to a refund if better power outputs are not achieved ..
At Oz Wind years of testing and experimenting are behind the wind turbines that we sell, to offer affordable quality wind turbines with out the cost usually associated with similar size turbines . Oz Wind are the Australian Distributor For Huaya, who are a highly reputable manufacturer of wind turbines from 500W to 30kW. 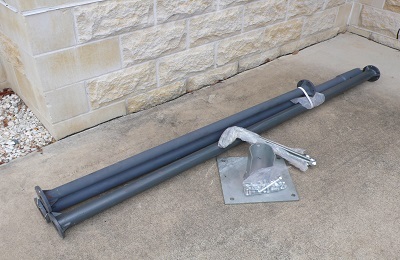 All OZ Wind Turbines under 2.5kw are built on the 2.5kW Nacelle Assy ( longest tail and strongest Nacelle Assy Possible ). From there the Oz Wind modifications and checks are done to make these the best performing wind turbines in the market today . All of the OZ Wind turbines are POWERED BY AUS BUILT GOE 222 BLADES, and not the std fiberglass blades . This one single modification puts our turbines kilowatt Hrs ahead in power production over the std turbine and this is guaranteed. We also back our products Australian warranty, on all manufacture defect problems. Warranty is dealt with here and not with someone who all of a sudden can not speak english. OZ Wind is committed to provide honest info & advice that most other sellers ( box shifters)do not can not supply. 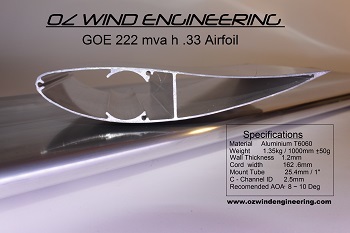 We strive to make systems as economical and efficient at the best possible price for quality that will last.The 1kW Turbine fitted with 2.8m GOE222 Airfoils and can be coupled with the Oz Wind Capacitor Power Maximizer that allows these turbines to produce power in 2.5m/s 7~9klm winds, from there they track the wind better and do not suffer from the constant hunting wind direction followed 360deg turns for no reason the Std turbine suffers from. 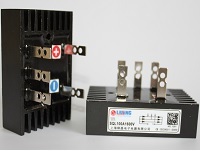 The GOE222 power difference is easily 2~3 times more accumulated power for storage over the day. this up . At 10 m/s the Oz Wind gen is pushing in excess of 1.4kW , where the standard turbine is struggling to push through 750W. The manufactures answer is to fit bigger blade sets @3.2m this greatly increases tower loading and can add to balance problem. For high wind zones we advise to make the blade dia Max 2.6m for 1 ~ 1.5 kW turbines for a longer service life and less stress on tower structures. We can also retro fit these blades to existing wind generators to give the same results and fully guarantee a refund if better power outputs are not achieved .. 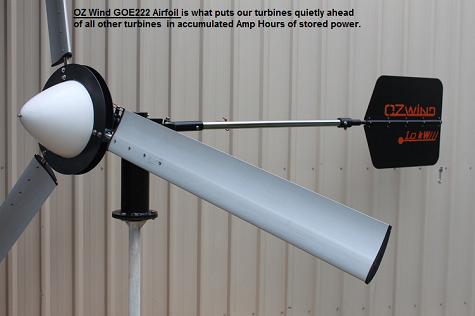 The OZ Wind 500W / 750W turbine is good strong turbine to add extra power smaller off-grid 12 and 24 volt systems. The Turbine kit comes with the powerful GOE222 blades. Based an OEM Chinese design that had its roots in Australia but as to be expected they need finishing off. We completely strip them and then modify the furling, balance the blades, beef up the wiring and set the correct blade angles that are match marked for correct re-assembly . . while the generators apart the bearings are replaced with better quality Japanese Or German parts. OZ Wind has been associated with these OEM turbines for many years and have tested many options. The blade Dia can be easily made bigger to increase the power , we then recommend and fit the manual furl with this modification if chosen. Please discuss the options for what is best for your needs. of building and locating all the necessary fittings for a turbine tower. location please consult with OZ Wind Engineering . GIN POLE AND WINCH OPTIONS AVAILABLE . 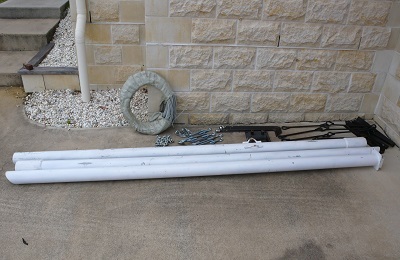 Optional - Welded Guy Attachment points , Guy Rope kit , Gin pole kit , winch . Good heavy duty 6 mtr tower that takes all the hard work and caculations out of building and locating all the necessary fittings for a wtg tower . This tower was origionaly designed to be a free standing tower, we do not recomend it be used this way ,and guy wires must be fitted . This requires welding on guy attachment points . Building and installing tower can easily add up to as much if not more than the Wind Turbine , these are an ecnomical professionally built tower for anyone without very good welding skills. For Individual design specifics for your location please consult with OZ Wind Engineering for modifications and advise. We give all info and help to source manufacture or supply any additional items to make lifting and lowering your tower as easy and safely as possible. 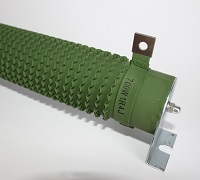 use as wind / hydro load resistors . good quality mounting brackets . on how to size the resistor for your intended maxium turbine capacity. 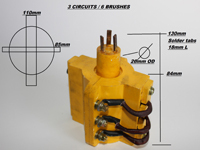 up different loads ( diversion or dump )"
$55ea or $140 set of 3.
for a 48V Turbine @ 2000W Rating. 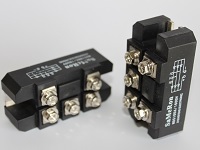 - Good Quality Rectifier suitable for Wind Turbines ,Mini Hydro , AC / DC Generators and other. 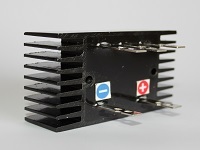 - Reliabality from encapulated in a fined aluminium case for cooling gives better duty cycle. M4 or M5 bolts , also solder connections direct. most Chinese wind turbine voltage controllers . Recommended mounting is on solid steel 25.4mm rods and we use 431 S/S then bolted or riveted ( 3 bolts under 3.2mtr Dia , 4 Bolts Over 3.2 - 3.8mtr ) Heavy walled tube 2.6~3mm 25.4mm can also be used min 30% with 8 x 5mm Rivets Min. 3 GOE blades 2.8M Dia H/Wind 2.6. OZ Wind 1kW and 2kW 48/24V MF , the MF standing for manual furl and is described in more detail below. They come standard with the OZ Wind ALU GOE222 blades and are fully balanced to within 4 grams and then match marked for exact re-assy. They are also supplied with a controller and dump load again described below. 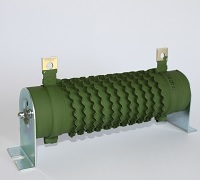 The generator is of a more radial flux type 3 phase PMA and reaches charge voltage ( cut-in ) at quite low rpms @ approx. 140rpm for both 48v & 24V with max output below 350 Rpm making it quiet and more controlled. 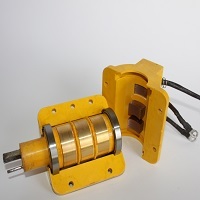 The Generator / Blade set run on solid 35mm main shaft and large 6207 2RS bearings, with top quality JAP or German Bearings. Each nacelle is constructed with very heavy walled steel at 8 to 10mm wall and with custom welded construction and not cast steel or cheap cast aluminium, all up the nacelle weighs for the 1kW @ 56kg and 2 kW @ 65 kg ( please see construction pictures ) . 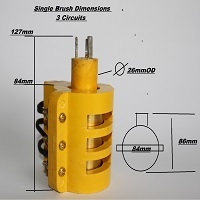 The slip-rings are good quality 6 brush (double brush) 3 circuit and rewired with double output wiring. The tail length is at almost 2mtrs for optimum positive wind tracking. All bolts are Allen Head Stainless Steel as is the tail rod and blade mounts Also supplied is a mating flange to weld to your tower. MF rope that exits the tower at about 2.9m from the base. a normal and the turbine with furling tail in high winds. be set to customer’s battery specs to 0.1 V accuracy. manually furled and in manual diversion is in safe park position . out put 3 phase wind turbine generators and with the 3 brushes . with solder and come pre tinned. to a DIY wind generator build . 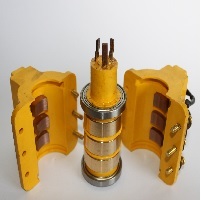 -This slip ring assembly is perfect for higher out put 3 phase wind turbines. 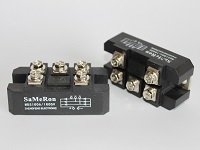 - With 6 Brushes there is less possibilty of loosing an output phase and less power loss. 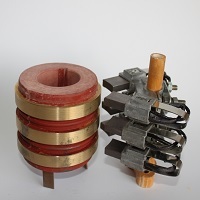 -Good quality slip rings to and easily added to a DIY wind generator build . just to name a few as they are all virtually the same fitting dimensions. 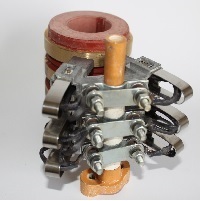 wind turbines and with the dual brush carrier then capable of low electrical loss normally associated with sliprings.